I’m ready for a brand new month! How about you? I always like to start a month with fresh new plans and goals. This month feels even better and brighter since we’re getting some warmer weather and my April is starting off with my spring break! 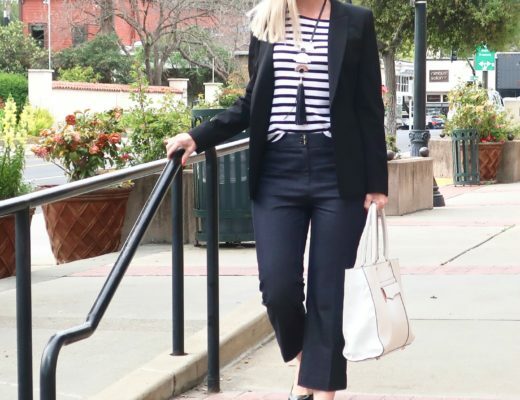 The pants are Essential Cotton-Stretch Ankle Pants (c/o J.Jill). Anyone else have a love/hate relationship with white pants? Do I even need to explain?! These are lightweight and stretchy and the perfect ankle length. Oh, and they come in other colors and prints too! And of course, I want them in black. 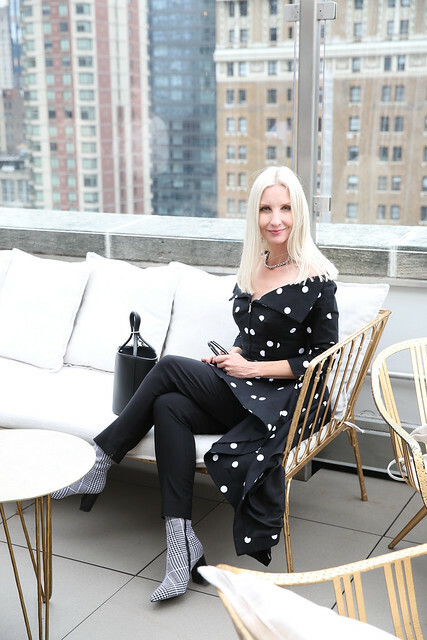 The Straw Bag with Drawstring (c/o J.Jill) is the cutest mid-size tote with feminine details like the floral lining with a drawstring to keep your items safe, as well as a cute little tassel. Also wearing my Kendra Scott Lacy earrings, Kendra Scott Elton cuff bracelet, Aldo cat-eye sunglasses (back in stock! ), also my Chico’s girlfriend bracelet and Italian Shoemaker sandals (both no longer available). I’ve been experimenting with my make-up recently and have a few fun new products to share. Long Last Liquid Eyeliner in Black Tea – I’m more of a eye pencil girl, but this goes on and stays on. Creamy Long Last Lip Liner in Punch – My new go-to lipliner. In love! Cocoa Butter Matte Lipstick in Protea – A bright pretty hot pink/fuschia shade. Better Naked Palette – a pretty and natural palette. Love Your So Mochi Electric Pastels Eyeshadow Palette – so much sparkle and fun in box! Micro Brow Pencil – I’m pretty attached to using powder on my brows, but this might change my mind. Finishing Powder in Translucent – gives a nice flattering finish. And wearing my old favorites – Clinique Beyond Perfecting Foundation and Covergirl Lash Blast. Hope everyone is having a beautiful start to their fresh new month! Let’s make April shine, Ladies! 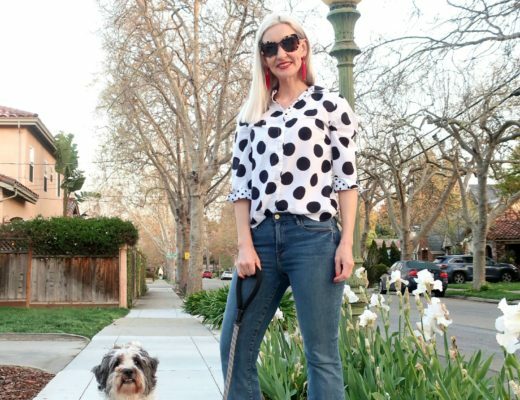 More spring style ideas … here, here, and here. 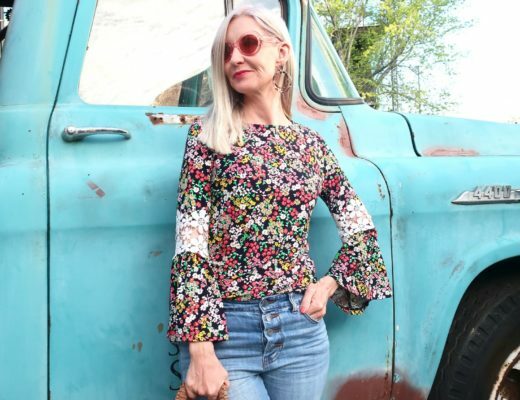 This is absolutely the perfect spring outfit! I hear ya with the love/hate relationship with white pants. You really have to find a good pair that flatters your body in order to be able to pull them off! Wondering if you have any suggestions where to find spring pants, especially casual ones, that fit pear shapes? .I seem to remember that you said you have a pear shape. I am slim, but have the hardest time finding pants to fit. If they fit in hips and thighs, they do not fit in the waist and vice versa. Have you ever blogged about that issue before? 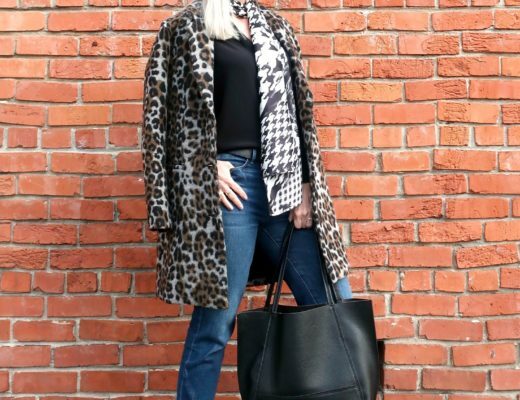 I will try the J.Jill pants you are wearing in this post.. I enjoy receiving your newsletter. Hi Carol! So fun to hear from you and I always love questions! Yeah, I’m pear shape for sure, so I hear ya on this issue. Loft, NYDJ, Gap, and Old Navy all have curvy cuts available and I do well with those options. Also any pants with a little stretch fit better too. 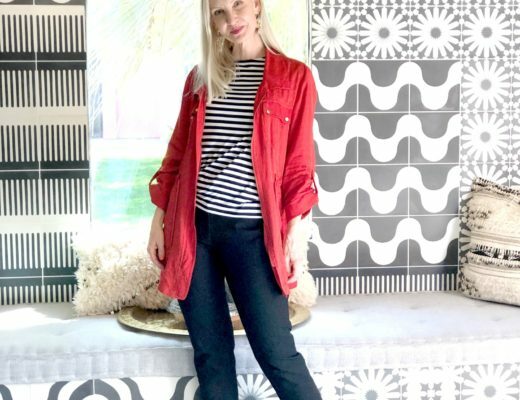 These J.Jill pants are stretchy and also I love my Chico’s So Slimming pants (stay away from their Diamond cut, it’s for women with the opposite problem!). Keep me posted on what you find because I always love suggestions too! I’ve been working on a post all about dressing for pear shapes for ages, so now you’ve motivated me to work on that again. Thanks! And thanks for being part of my newsletter crew too! You gals are extra special to me and I love sharing with you all. Your top is such a great colour, perfect for spring! I really like it with the white pants too. I’m too clumsy for white pants, but I admire them on others, haha! Aww you’re so sweet. Thanks, Patti! 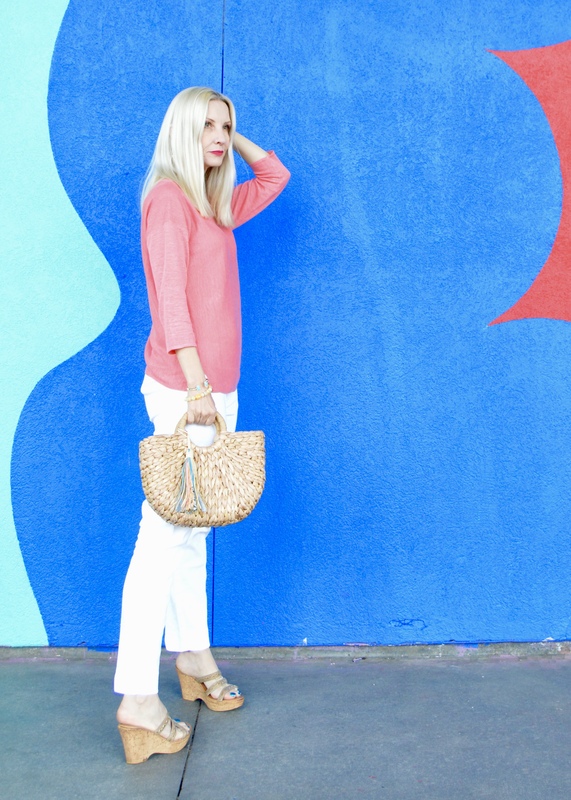 Great spring outfit; very nice white pants combined with the pink top! 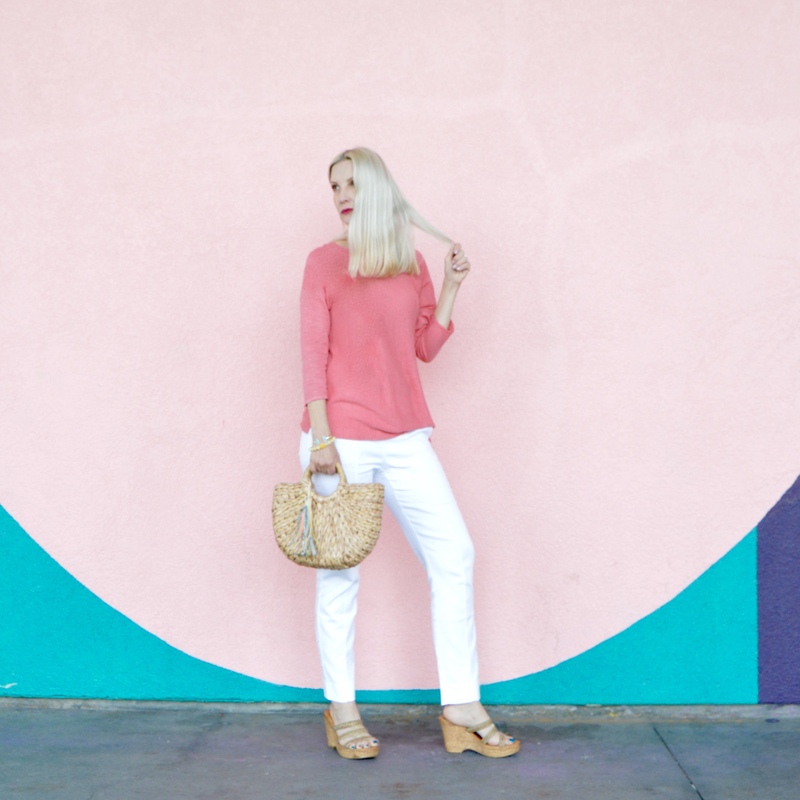 This outfit makes me want to head to a coastal destination stat! 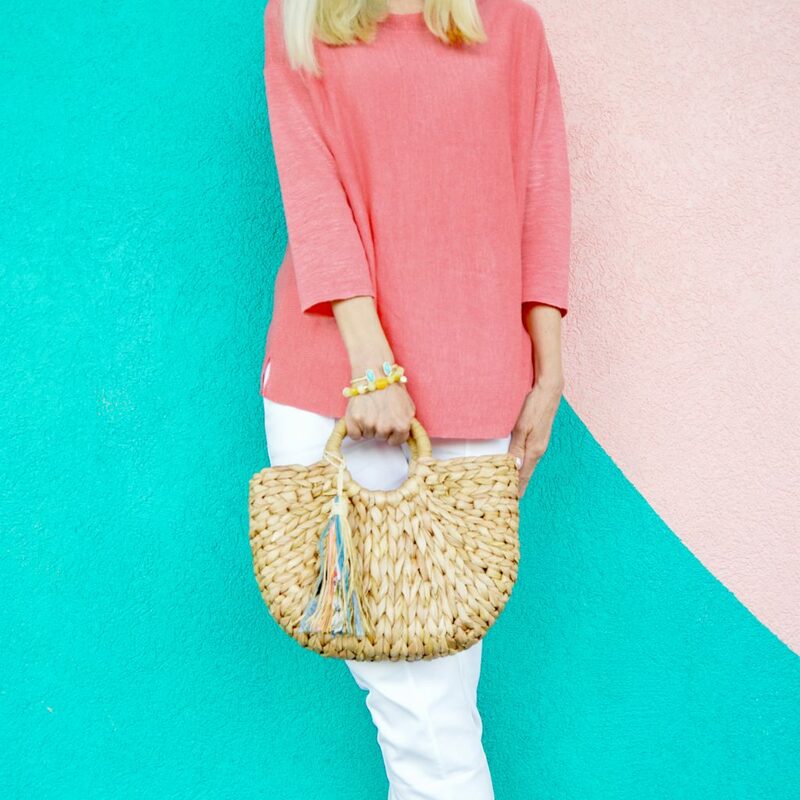 With the straw bag, bright top, and white pants it’s perfect for strolling the boardwalk. I’m ready for a fresh month, too! And one with some nicer weather. Pretty mix of pink and white on you! Looks like Spring! Loving this color on you Dawn Lucy! This sweater looks like the perfect weight.